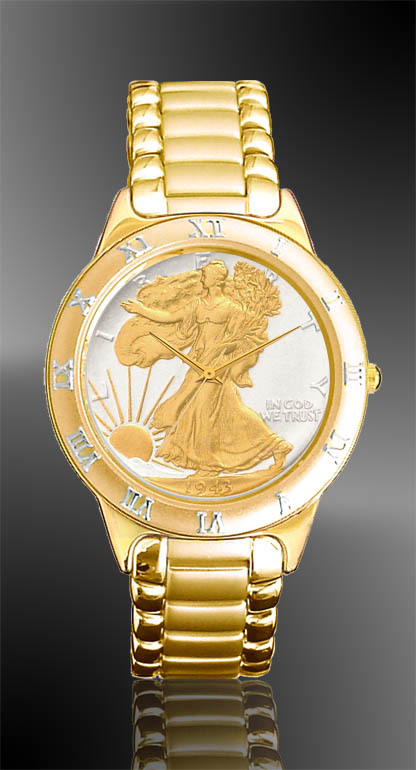 Our most popular coin, A.A. Weinman's "Walking Liberty" makes a timeless statement of classic design. This Lexington mens watch is our finest quality providing reliable, precision performance. The dial is a handpicked US Mint issued 90% pure silver Walking Liberty Half Dollar enhanced with AureTone ™ extreme precision 24K gold accents. A genuine Swiss quartz movement powers each watch, which is secured within a stylish stainless steel case and matching 3 micron gold plated bracelet. Our most popular coin, A.A. Weinman's "Walking Liberty" makes a timeless statement of classic design. This Lexington mens watch is our finest quality providing reliable, precision performance. 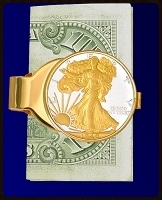 The dial is a handpicked US Mint issued 90% pure silver Walking Liberty Half Dollar enhanced with AureTone ™ extreme precision 24K gold accents. A genuine Swiss quartz movement powers each watch, which is secured within a stylish stainless steel case and matching 3 micron gold plated bracelet. Each includes a lifetime warranty against defect and is accompanied by a unique numbered signet and certificate of authenticity. Wow! I bought this watch way beyond my typical budget for a watch. I am a banker, and have had my interest in this watch for awhile. I decided to treat myself for my birthday and I am beyond impressed. Even though I love it, this watch will only be brought out for special occasions it's that nice. The watch comes with a large enough band for any size wrist, and was an easy resize with the jeweler next to my work. That jeweler couldn't help but compliment the watch as well! Terrific work, I will be shopping repeatedly. Yesterday was my Father's 65th Birthday, & I am Happy to report he is an avid Coin Collector ... & he loved the Walking Liberty Half Dollar Men's Coin Watch that you all engraved! Thank you for your Customer Service, Care to Detail, Timeliness in Process Ordering, & Followup here ... I plan to continue to Pass Aurista's Name along, & Order further Gifts!